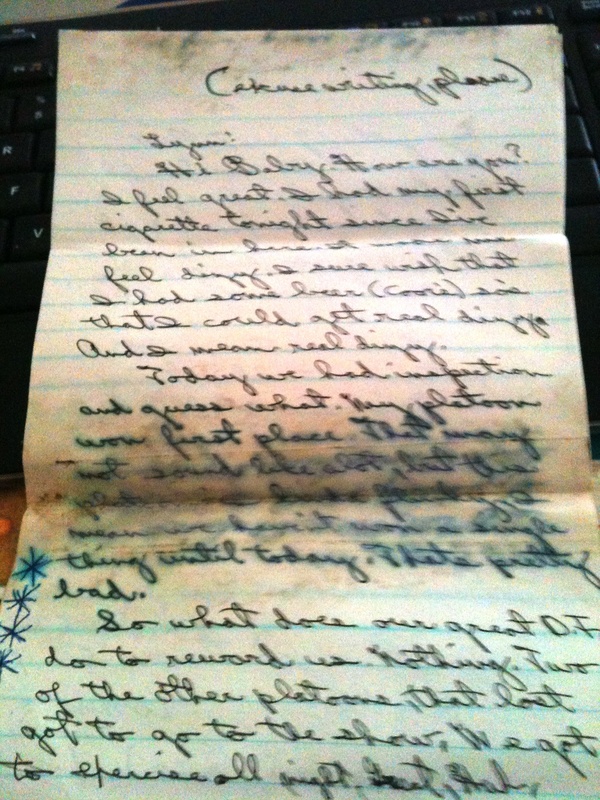 I’ve opened letters from you dated November 12 and 13, 1965. Both of them say “Hello Mrs. Due” on the envelope backs. Ah, my friend, you do keep me smiling. Small acts of kindness and respect were your forte. Remember the early eighties and how you’d visit convalescent homes and hang out in the visiting rooms until you spotted a resident who seemingly had no visitors? Usually a widow, you made friends with her by the time Thanksgiving rolled around and while I peeled potatoes and basted a turkey, you drove up to Redding to fetch our guest for the day. You made a difference in her life. In the lives of others you shared our home with during the holidays. In the lives of our kids, too. By example. What were you out? A little time? And what did we gain—all of us? I can’t speak for all of us, only for me, and what I gained was a swollen respect for the man I’d married. The letters inside those envelopes? A surprising revelation in one, little boy. Cigarettes? Smoking? Not my Alsie. Not the Alsie I remember. Even I didn’t smoke back then. Not in ’65. I remember Tom smoked—Marlboros, I think—at least he did for a while those first years I came to know him. But you? That’s a bummer about winning first with platoon inspection and earning night exercises as your reward. Your D.I. doesn’t sound like such a “great guy” to me. Then again, maybe all that exercising, those runs of two, four, and seven miles, push-ups in the mud, squat thrusts and what all are the conditioning you needed to get through the year ahead, huh? You wrote: Well Tom finally got his chance at being guide. I hope he stays there. If he does, he’s bound to get his stripe and also he’ll get a free set of dress blues. All next week, starting tomorrow, we have mess duty, so Tom won’t have much trouble then, but after that he’ll have to watch his step. Their changing it so often now, I kind of doubt that he’ll last. Good old Tom. I think his dark hair may have grown a little salt and pepper in color before you took leave of this world. I can report the pepper’s gone missing, all salty shades of pale gray now. Plus he’s a grandpa of six. He and Bonnie burn up the road between Aubrie’s, Amber’s and Jimmy’s homes as they visit each set of two grandbabies. Aub’s two boys; Amber’s two boys; and Jimmy’s boy and a girl. Did you hear that sigh I released? Sorry. Just wishing your grandkids knew you. Wait a sec. There’s something special I can add here. It’s really, really cool. A gift from Riley Lynn, Aimee’s daughter. She’s ten. And she made this in remembrance of you. 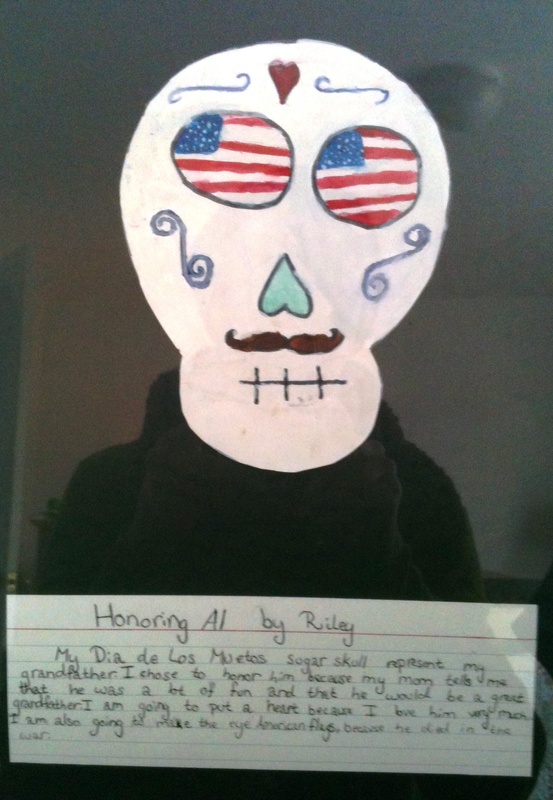 Riley writes: My Dia de los Muertos sugar skull represent(s) my grandfather. I chose to honor him because my mom tells me that he was a lot of fun and that he would be a great grandfather. I am going to put a heart because I love him very much. I am also going to make the eyes American flags because he died in the war. Someday she’ll understand you didn’t die “in” the war. It killed you, sure enough, but that stupid blood clot took twenty-two years to hit its target. I was so proud of her, of Aimee for making her know you through stories, when I saw what she’d done for you. I’m more aware of Dia de los Muertos (Day of the Dead) down here in Baja than I was in up in Cottonwood, Alsie. It’s big with Latino cultures. The first couple days of November are bright with buckets of marigolds and altars honoring those loved but no longer physically with them; favorites (food, booze, you name it) are placed at the altars along with pictures of the sister, brother, mother, son, husband … whoever the loved and lost may be.